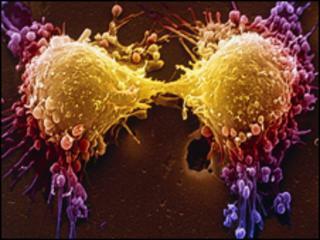 Programmable proteins could soon be revealing how cancer cells survive attempts to kill them. Built by UK researchers, the chemically engineered molecules are made to resemble key proteins that control the longevity of cancer cells. The tiny proteins, known as biophotonic nanoswitches, adopt an active form when hit with a pulse of light. The researchers hope the activated proteins will shut off the processes that keep tumour cells growing. While all cells strive to stay alive, tumour cells seem particularly resilient towards attack by drugs and other attempts to kill them. To find a way to interrupt this longevity a group of researchers are developing custom-built peptides; pieces of proteins that can be manipulated to resemble critical parts of the ones found in cells. "Proteins only have a function when they adopt a well-defined 3D structure," said project leader Professor Rudolf Allemann from the School of Chemistry at Cardiff University, who designed the peptides. Built using a synthesis machine, the normally inactive peptides sport a section that deforms when hit with a flash of light of the right wavelength. Deforming the peptide turns it from an inert form into one that is active with a shape complementary to its cellular targets. The active form is exactly the right shape to bind to a location on a larger protein molecule in a cell. Chemically-created biophotonic nanoswitches are attached to short pieces of protein, or peptides. The nanoswitch "backbone" is activated when it is hit by a certain wavelength of light. The light causes the nanoswitch to deform, in turn changing the peptide into an active shape. The peptide can now bind with a target protein in the cell, triggering or shutting down a chemical process. "The cell is a thick soup of proteins, with rather uniform and shallow surfaces that are difficult to target with conventional small molecule based drugs," said Professor Allemann. The active form acts like a car ignition key turning the "engine" keeping a cell going on or off. "We try to target these protein surfaces using peptides taken from natural proteins that should allow us to control protein-protein interactions," he said. "This is chemistry at work; based on a fundamental physical understanding of biological chemistry, we use simple chemical building blocks to control the complex biochemical machinery inside a cell." The researchers are not trying to control all the processes going on in a cell. Instead, said research partner Professor Paul Smith from the Cardiff Medical School, they are focussing on those processes, known as pathways, which help keep a cell healthy. "There are pathways that signal damage in a cell and decide whether it should die or go on living," said Professor Smith. Dr Rachel Errington added: "Those are the pathways that respond to environmental stress. We've chosen to target two major pathways knowing that people will be interested in switching them on or off at discrete points." These pathways, regulated by critical proteins called Bcl-2 and p53, control processes such as cell division and cell survival. Aberrations in the regulation of these pathways account for a large number of tumors. With the right peptides, it might become possible to effectively switch off a tumour cell simply by applying a pulse of light. "Biophotonic nanoswitches are now put inside cells and then hit with a pulse of light to see if the biological properties of these cells can be controlled," said Dr Arwyn Jones of Cardiff University's School of Pharmacy. The researchers are refining their techniques by trying to find out how much of their custom-built peptide has to be added to a cell to get an effect, mapping where the nanoswitches travel to and working out the best way to manipulate these critical pathways. "From an engineering viewpoint we're particularly interested in the control systems that cells employ to regulate their internal processes and hence maintain their function," said Professor Huw Summers from the School of Engineering at the University of Swansea. "Peptide molecules are key components in these regulation systems." He added that the team did not simply wish to gain an ability to switch these systems on and off but also wanted to find out whether they could manipulate the rate at which the feedback systems operate. "We're also looking at how much light is required to activate the biophotonic nanoswitches and how long they remain in the on-state at body temperature," he said. The custom-built peptides fluoresce so the researchers can map where they go once they have been placed inside a cell. "The early success with tumour cells suggests that the approach may be more widely applicable," said Dr Errington. "There's tissue engineering and all sorts of application areas where we would want to switch a molecular process or change the fate and direction of the pathway," she said. If proteins that cause cells to change their type could be controlled in this way, then a pattern of light pulses could transform a uniform sheet of stem cells into tissues containing an ordered array of different cell types - a stepping stone to growing replacement organs.